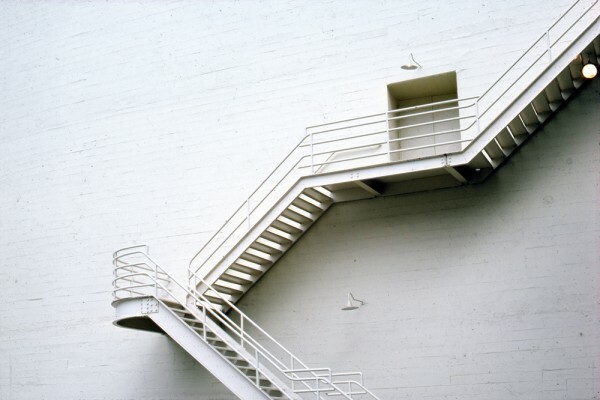 Descending along the sidewall of the Paramount Theatre in Oakland, the emergency exit stairs played a starring role in Jim Melchert’s outdoor Location Project #10 (November 1974). The Oakland-based artist shot various angles of the structural elements of this south wall from the parking lot below. For approximately two hours each night for a week, he projected a different color slide transparency onto the movie palace from the location of the Capwell’s department store (now Sears) facing opposite. Five of the seven daytime images he used to activate the site feature the elegant form of the stairs and its shadows. 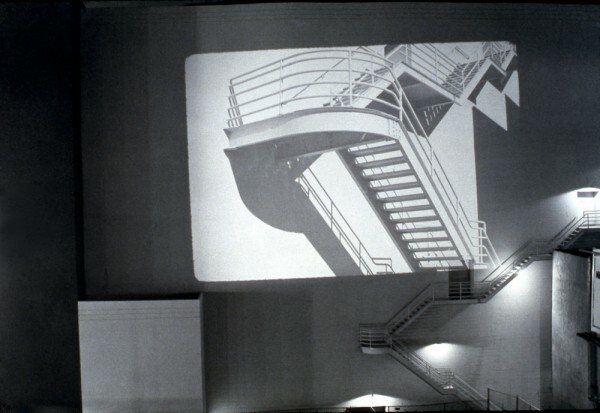 He transposed these fragments of the exterior surface onto the building itself, establishing “a structure out of combined points of view.” This play between real and pictured space on one evening included an enlargement of his own silhouette photographing his shadow against the wall. Melchert’s previous location projects consisted of indoor sequences of people, often other artist friends, moving in relation to the planes of a wall and floor, projected life-size onto the same wall where these participants had carried out an action. Location Project #10 expanded on that approach and combined it with an interest in how our perception reconciles two views of the same situation. The project was organized by The Oakland Museum as part of the offsite Environmental Events section of the exhibition Public Sculpture/Urban Environment (1974). Apart from a change in paint color, the Paramount’s façade seems unchanged nearly forty years later and holds the same possibility — a bare expanse for projection. Tanya Zimbardo is the Assistant Curator of Media Arts at SFMOMA. She frequently contributes posts to OPEN SPACE on the museum’s exhibition history as well as her interests in Bay Area Conceptual art, video, expanded cinema and outdoor projects.